Its made from wheat and semolina flour, deep fried into little balls, it is then filled with a mixture of tamarind and mint and pieces of potato and mixed spices, ‘Pani’. 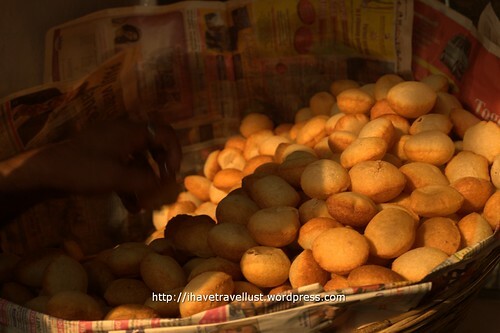 In Old Delhi it cost from 5rp to 10rp for 5-6 pieces, in Calcutta it cost 3rp – 5rp on average. 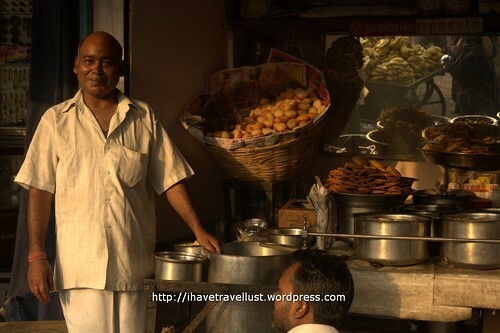 Tasted a few dreadful versions in places like Manali, some parts of New Delhi and other places, this Old Delhi Pani Puri stall owner puts pride in his creation. The pani burst with sweet, sour and spicy mixtures in your mouth. Really great and cheap too! 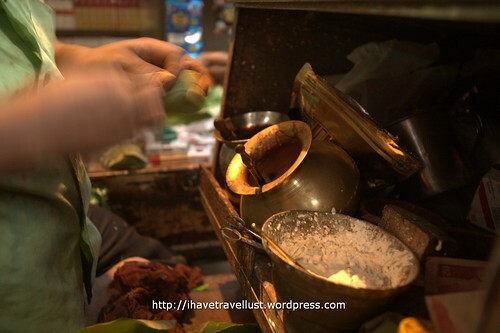 Sweet yummy paan with coconut flakes and fruit preserves. In Old Delhi, the street food here is great, while Calcutta can get considered as the Queen of great Bengali street food, Old Delhi is great for its Mughal influenced Muslim delights. 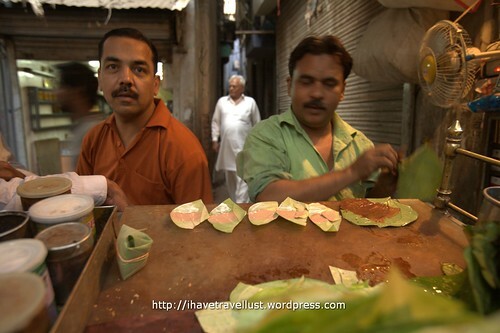 One of the weirdest thing I am getting addicted to, is the great quality sweet paan from Old Delhi. An average it cost from 3rp – 10rp. 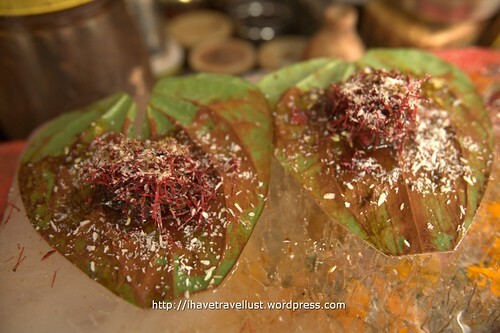 Paan which is betel nut and its leaf is kinda of a dessert or a mouth-freshener which proofs to be a little addictive, where everyone seem to have in their mouth, chewing and splitting constantly. I have tried betel nut leaf in many places around India and Burma, I hate it, they taste bitter and have this tongue and mouth numbing effect that it last for an hour. 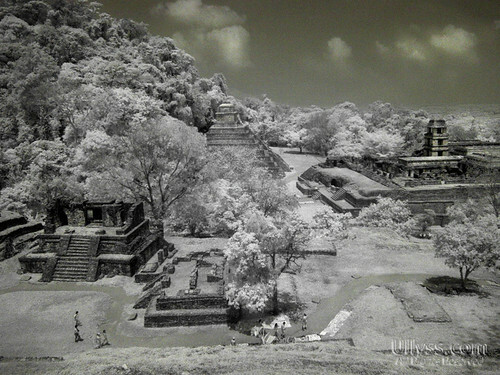 In Megahalaya, the Khasi tribe tradition to serve a tongue numbing mix of limestone and bitter betel nut leaf, the womenfolk loves their betel nut as shown in the red and black decaying teeth and their blood stained lips. Nagaland where a naga man once told me, chewing betel nut is healthy for teeth while showing his decaying black stained set of ivory and in Calcutta where they constantly chew the processed and dried version of it and forever seem to be splitting all over the streets of Calcutta. 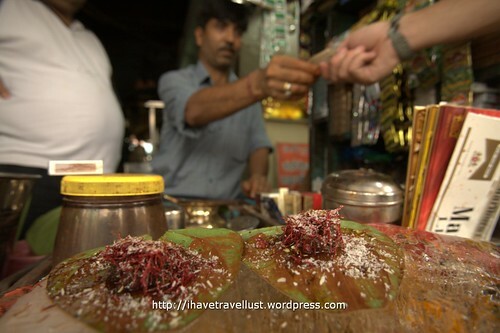 The paan in Old Delhi is kinda different, the leaf is sweet tasting and you get the choice of putting a sweet version of some fruit sugar instead of that horrid limestone paste. The Paan maker gives you a whole selection of his fruit preserves, dried coconut flakes, candied spices and herbs such as fennel, and a whole lot of different syrups made from saffron, dates, honey and jaggery (brown palm sugar), of course they do add the fresh betel nut, which I usually opt out. I don’t seem to know how to chew the fresh betel nut, its tough and hard and it almost breaks or chip your teeth. 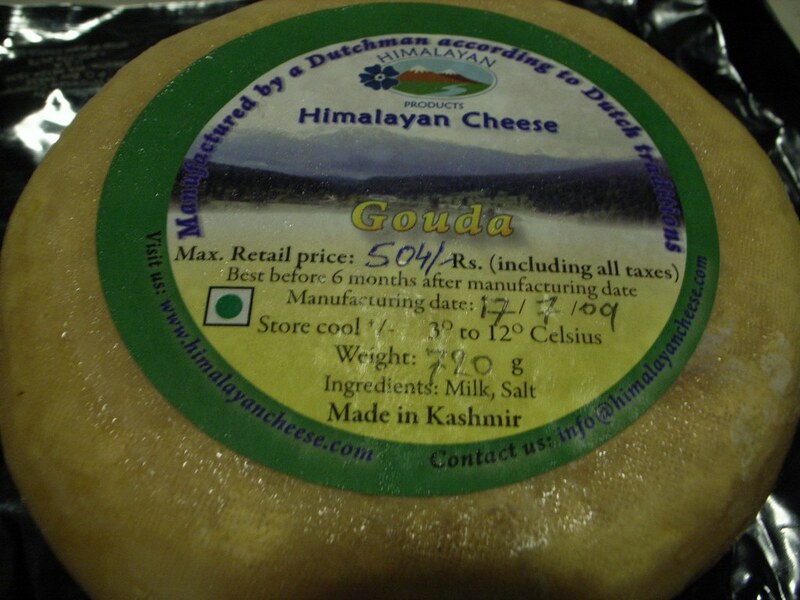 Got some himalayan cheese (average 750g each) from Pahalgam, Kashmir. 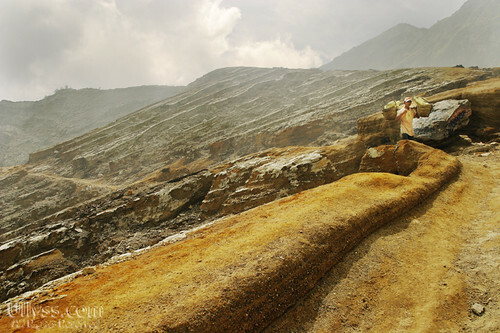 The company (Himalayan cheese company) claim to have collected the cow milk from nomads, highest quality grade milk with grass fed cows in high altitude highlands. 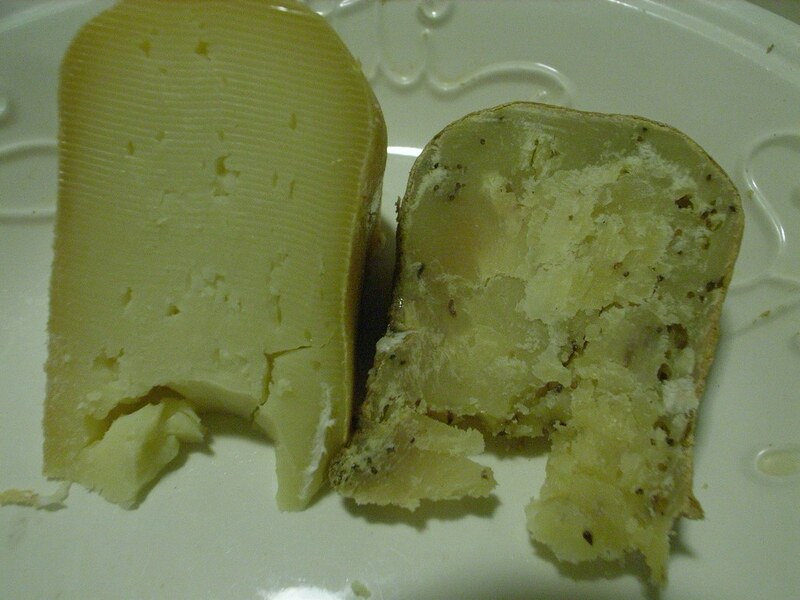 Its unpasturised and made by the traditional method, by hand and the cheese is even transported by mules and horses. 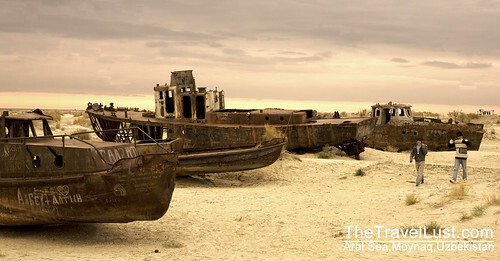 How environmentally friendly! Bought young 2 month old gouda and a one year old gouda. 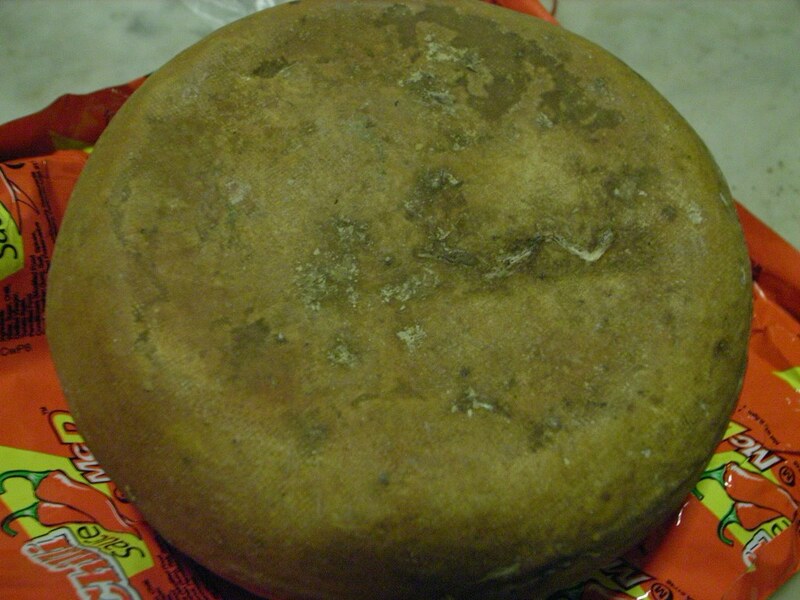 The one year old gouda is amazingly matured and taste more like vintage chedar than a gouda. Interestingly not much fat content in the cheese but taste heavenly. I am addicted! the delhi music and clubbing scene is huge and very trendy, feels like I am in LA or HK. Am impressed. Back to big cities and airconditioned places with pricey beer and food joints. 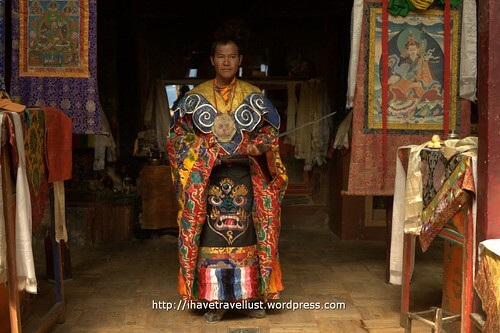 Great place to be for a few days before heading to visit the Dalai Lama place at McLeod Ganj.